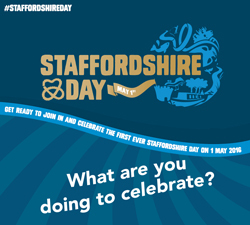 The first ever Staffordshire Day will take place on Sunday 1st May, and Staffs County Council want you to get involved! While many other counties have their own official celebrations, Staffordshire have never had one until now, so this is a chance to shout about the greatness of Staffordshire! So if you’re thrilled by our theme parks, honoured by our history and heritage, proud of our people, or cherish our countryside, help spread the word on social media, using the #StaffordshireDay hashtag. There will be lots of events and activities going on in towns and cities, and at visitor attractions across the county. ‘How the Monkeys came to Staffordshire’ will tell the story of how the macaques, which originate from Algeria and Morocco, came to the Trentham Monkey Forest, near Stoke-on-Trent, and why the county was chosen over any other. And ‘A Day at the Lake’ at Rudyard Lake near Leek will recreate a famous event from 1864, when Carlos Trower – also known as ‘The African Blondin’ walked across the lake on a tightrope! A major event is also planned for the World of Wedgwood visitor experience in Barlaston. More events will be added to the dedicated Staffordshire Day web page, and we’re organising special offers and competitions too! And some of our top places to eat will be offering Staffordshire-themed menus! Let’s make Staffordshire Day a party to remember!